Weak Brain Connections May Link Premature Birth And Later Disorders : Shots - Health News Brain scans found abnormally weak connections in the brains of premature infants may make them more prone to develop autism, attention deficit hyperactivity disorder and other emotional disorders. Researchers have used MRI scanners to learn that preemies are born with weak connections in some critical brain networks. Babies born prematurely are much more likely than other children to develop autism, ADHD and emotional disorders. Now researchers think they may have an idea about how that could happen. 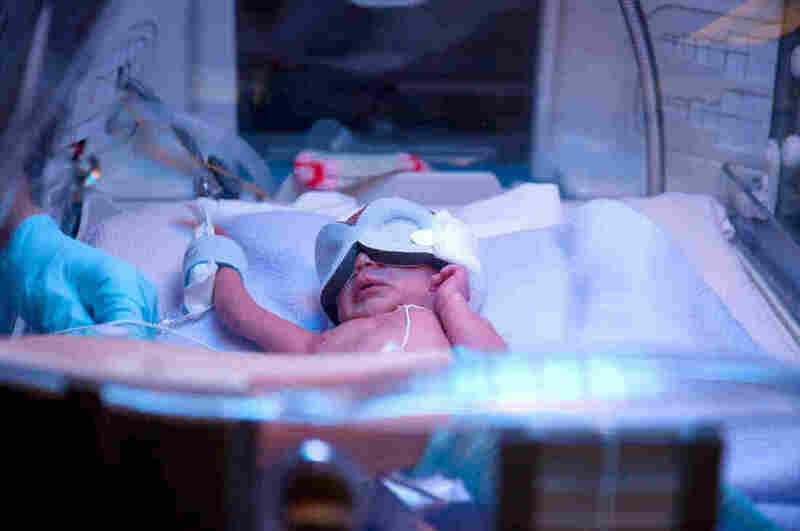 There's evidence that preemies are born with weak connections in some critical brain networks, including those involved in focus, social interactions, and emotional processing, researchers reported at the Society for Neuroscience meeting in Chicago. A study comparing MRI scans of the brains of 58 full-term babies with those of 76 babies born at least 10 weeks early found that "preterm infants indeed have abnormal structural brain connections," says Cynthia Rogers, an assistant professor of psychiatry at Washington University School of Medicine in St. Louis. "We were really interested that the tracts that we know connect areas that are involved in attention and emotional networks were heavily affected," Rogers says. That would make it harder for these brain areas to work together to focus on a goal or read social cues or regulate emotions, she says. The team used two different types of MRI to study the nerve fibers that carry signals from one part of the brain to another and measure how well different areas of the brain are communicating. Full-term infants were scanned shortly after they were born, while premature infants were scanned near their expected due date. The researchers are continuing to monitor the brains of the children in their study to see which ones actually develop disorders. Another team attending the neuroscience meeting presented evidence that at least some of the brain connection differences found in preemies at birth are also present during pregnancy. The team used new MRI technology that allowed them to study the brains of 36 fetuses during the 30th week of pregnancy. Half the fetuses went on to be delivered prematurely and half went to full term. When the researchers looked at connections between areas of the brain involved in movement and balance, the full-term fetuses had "higher levels of connectivity than the preterm born," says Moriah Thomason, an assistant professor in the Department of Pediatrics from Wayne State University School of Medicine in Detroit. This could explain why premature babies often are late to sit up and stand, she says. The results suggest that it's not necessarily premature birth itself causing brain connection problems, Thomason says. Both premature birth and weak brain connections, she says, may be triggered by factors like stress or illness or exposure to toxins. The new research does a good job revealing a problem in premature brains, says Jay Giedd, a professor of psychiatry at the University of California, San Diego who was not involved in either study. Now, he says, scientists and doctors will have to find a solution. "The trouble is we really don't know how to change the connections very well," he says. "Can we do it with video games, exercise, meditation, yoga, diet?" Ultimately, Giedd says, it's likely that repair work on the faulty brain circuits associated with prematurity should begin well before a child is born. It may be possible to stimulate developing brain circuits in utero with sound or something more invasive.